Jeffery Donaldson was born in Toronto and educated at Victoria College, University of Toronto. He teaches poetry and poetics, American literature, and Inquiry in the English Department at McMaster University. He is co-editor of Frye and the Word: Religious Contexts in the Writings of Northrop Frye and author of four books of poetry: Once Out of Nature, Waterglass, Palilalia, Guesswork, and most recently Slack Action (Porcupine’s Quill, 2013). 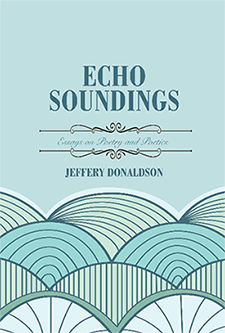 A collection of essays on poetry and poetics, Echo Soundings, was published by Palimpsest Press this fall. "Museum" first appeared in Palilalia (McGill-Queen's, 2008), and “House of Cards” in Slack Action, (Porcupine’s Quill, 2013); reprinted here with permission. Donaldson received the City of Hamilton Arts Award for Writing in 2011.